If you suffer from allergies or asthma, you know how your home can impact your health. 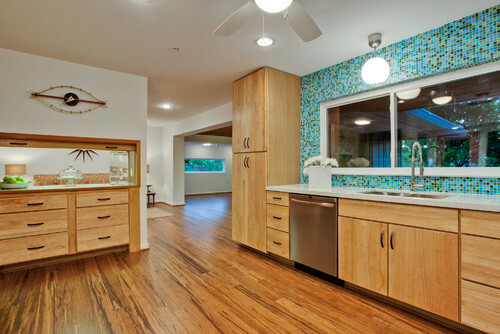 Perhaps no other part of your home gets as much attention – and scrutiny – as flooring. From carpeting to hardwoods, you might be stressing over what are the best allergy friendly flooring options. You do have reason for concern when thinking about your floors and how they can affect your health. After all, flooring takes up SO MUCH SPACE in your home. In fact, it covers every square foot inside your home. You are not being paranoid or worried for no good reason. However, there are so many great options for allergy and asthma sufferers that you don’t have to be stressed anymore. 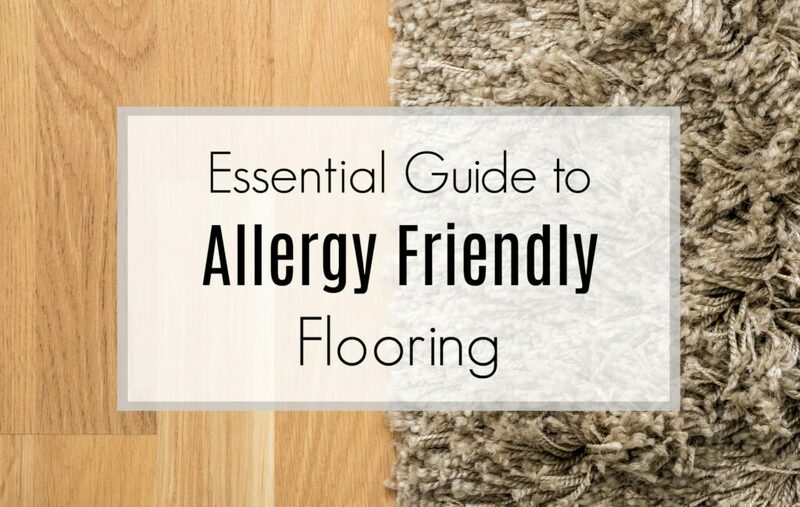 Here’s all the information you need to choose allergy-friendly flooring choices. And, yes, there are options for carpeting, hardwoods and other flooring surfaces. As a WELL AP, I also share the guidelines for flooring that help qualify for WELL Certification. The WELL Standard is a certification to create healthier living and working environments. While individual homes can’t qualify for WELL Certification yet, I love sharing the ideas that help commercial business achieve this certification that directly benefits everyone who enters the space. 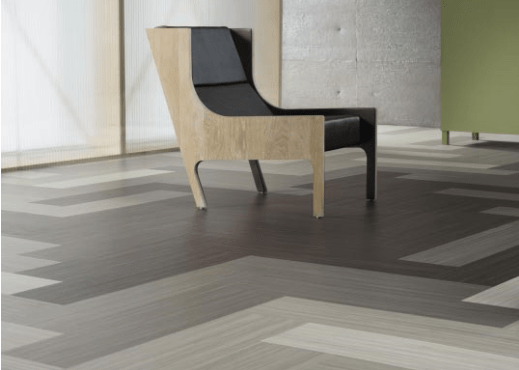 And while the focus is generally on allergies and asthma, keep in mind that Multiple Chemical Sensitivities can be benefited from choosing these allergy friendly flooring options, too. There are WAY more flooring choices other than carpet or hardwood floors. In fact, you might be surprised at all of the different types of flooring there are to choose from. 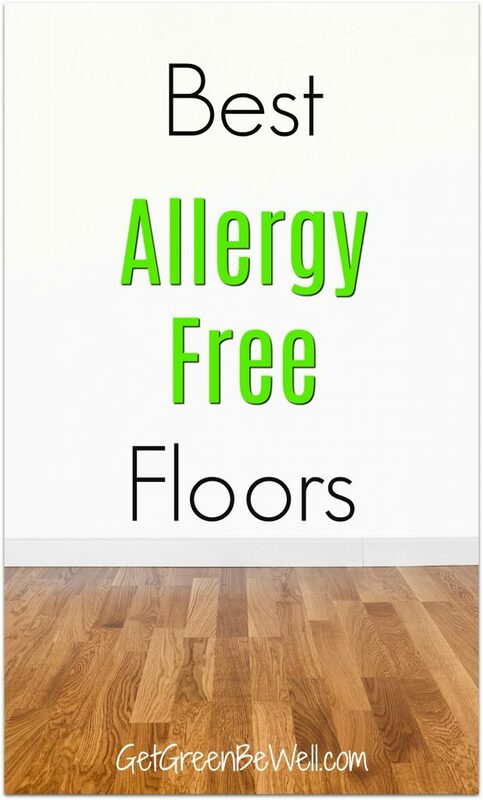 Many are ideal for allergy friendly flooring and for those with asthma. Carpeting The softest floor possible, wall to wall carpeting is a solid sheet of carpeting that extends to every wall within a room. A padding is necessary underneath the carpeting. Large removable area rugs are another option. Hardwood floors Made of strips of one solid piece of wood, this choice can be among the most expensive. You can purchase prefinished hardwood floors, or unfinished wood floors and apply a protective finish on your own. Engineered hardwood floors They look like hardwood floors, but are cheaper. Engineered hardwood floors offer a more budget-friendly option by laminating several pieces of hardwood together to create one solid floor. 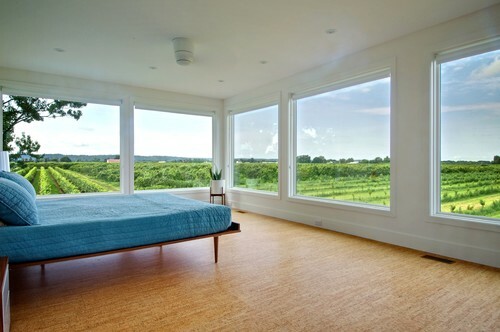 Bamboo Similar to hardwood floors, bamboo flooring is made of renewable bamboo grass. Laminate It can look like wood or stone without the hefty price tag! Laminate is often made of many layers of synthetic resins and fiberboard. Vinyl Among the cheapest flooring choices, peel-and-stick vinyl tiles are extremely easy to install and come in a wide variety of colors and textures. Linoleum Made with just linseed oil, cork dust, wood flour, resins and pigments, linoleum has always been one of the more non-toxic choices. Stone Slabs of stone such as granite, marble and slate can be much more expensive than other flooring choices. Tile Often made of ceramic or glass, tile flooring is installed with grout and creates a hard surface. Cork Cork flooring comes from tree bark.. It can look like a traditional corkboard or come in a variety of colors or finishes so that you don’t even know it is cork. Concrete Yep, it’s the same surface that’s on your driveway or patio. It can be polished and stained to create indoor flooring, too. Watch HGTV’s House Hunters long enough and you’ll quickly realize that there are two types of people in the world: carpet lovers and carpet haters. On the carpet lover’s side is the fact that carpeting is cushy, soft on the feet, softens noise levels and offers color (if you want) in the room. The carpet haters will say that carpet traps dust and allergens, harbors mold, and requires more maintenance. Both are right. It’s a fair fight. So, if you’re looking for me to say choose one or the other, I won’t do it. Because it all depends on your lifestyle, your needs, and your desire (or lack of) to do proper cleaning. It’s important to note that for WELL Certification, there is no one particular flooring choice that is recommended. It’s all about avoidance to toxic chemical exposure (more on that below). 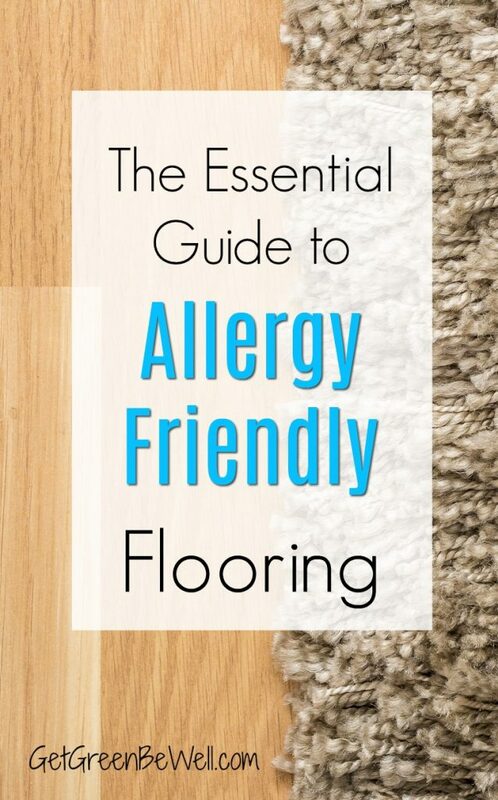 Before you can choose the best allergy-friendly flooring, you’ve got to ask yourself some hard questions about your lifestyle and your family, though. Will pets be on the floor? Are there young kids in the house learning to crawl – or are you planning on adding more children in the future? Is anyone diagnosed with allergies to dust mites, vinyl, specific chemicals, etc.? Do you have Multiple Chemical Sensitivities? Do you have worries about specific allergens, or are you trying to create a more general allergy-friendly home? Are sand, dirt or clay something that is commonly dragged in on your feet at your home? Is noise an issue in your home or certain rooms of your home? Are there moisture issues or high humidity? Do you have joint issues or arthritis that could be affected by hard flooring? Are any family members using a walker, wheelchair or other assistive device that would be easier to use on hardwood flooring? Are you looking towards an Aging in Place home and want to prepare for what’s to come in the decades ahead for you or another family member? All of these are very real questions to consider. And there is no right or wrong answer. Unless, of course, you have a specific diagnosed allergy. Then the answer is to avoid all flooring that harbors or contains that allergen. Why is Carpet Bad for Allergies? Carpet is often blamed for indoor allergies and asthma attacks. It’s true, traditional carpet handled in normal ways might be the reason why you have indoor allergies. The fibers of carpet trap these microscopic particles and don’t let go. That is, unless you vacuum frequently. But a lot of people don’t vacuum frequently. Wall to wall carpet is also a problem for allergies and asthma because problems can accumulate for years under the surface. So whether you’ve moved into someone else’s house and inherited the carpeting, or you’re just now becoming more allergy-aware after years of not treating your carpet right, there could be a LOT of issues in your carpeting that you can’t see and can’t get to. That’s the problem. No amount of vacuuming can truly erase the nasty stuff going on underneath wall to wall carpeting. And, it’s not just the carpeting that’s the problem. There is a padding layer underneath the carpet, too. This is where dirt, dust and pollen can settle and not get out. Or where mold is growing in the padding after a spill, pets peeing on the carpet, a flooding issue, etc. That’s not to say that all carpeting is bad, though, all the time. If you have area carpets that can be removed or cleaned easily, or carpet panels that can be taken up and replaced, then carpeting isn’t as bad for allergies and asthma. 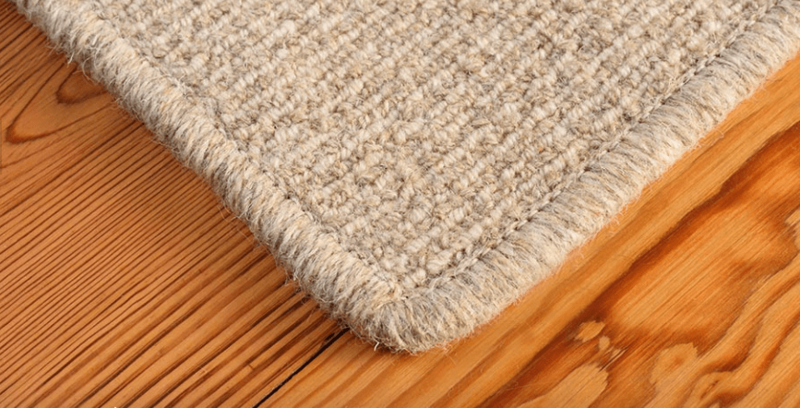 Especially if you have chosen natural fibers for your carpeting that are naturally resistant to dust mites. If you are suffering from a runny nose, watery eyes, problems breathing, coughing, etc. you might blame the symptoms on indoor allergies. And assume that it’s because of dust, mold or pollen. Because VOCs (Volatile Organic Compounds) can also make you experience allergies or asthma, or other symptoms which might be Multiple Chemical Sensitivity (MCS). So, it turns out, carpet isn’t always the worst flooring choice for allergies or asthma. In some cases, it can actually be better. VOCs are tiny bits of chemicals (such as formaldehyde) that escape into the air from products or finishes. When they escape into the air that you breathe, it is called off gassing (here’s why it’s so bad). VOCs are especially common in finishes, glues and sealants used in flooring. They can continue to come out of your flooring for months and years in your home. Which means you might be surrounding yourself with chemicals causing indoor allergies and asthma and never know why you can’t get any relief. Personally, I can handle mold and dust a lot better than I can handle VOCs. I have more indoor allergies in new environments with new flooring, rather than old environments with dust and mold. And VOCs aren’t just in carpeting. They are very common in all different types of flooring. So if you are adamant about getting rid of carpet but choose the wrong type of alternate flooring instead, you could never get over your indoor allergies. Or they might become worse! The only way to know for sure what VOCs are in a flooring product is to ask the manufacturer for the Material Safety Data Sheet (MSDS). This will list every ingredient used in the flooring. It’s also wise to ask the manufacturer directly via phone or email, too. Using products with proper certification, such as the FloorScore, or from a company such as Green Building Supply, can also steer you in the right direction. Each type of flooring has a different way of potentially exposing you to VOCs. Here are the specific ways to avoid VOCs in flooring. A new carpet smell is never a good thing. I can attest to that. I’ve been to many major conferences where vendors create large booths decorated with carpeting, furniture, etc. The smell of new carpeting is so intense in these conference halls that I can only take about half a day before my throat is burning, my eyes are watering, and I feel ill.
A new carpet smell is actually an accumulation of toxic chemicals escaping into the air from the manufacturing of the carpet. Because in the U.S. 99% of all materials used to create carpet are synthetic. Choosing natural fibers isn’t always the best answer to protect from VOC exposure from flooring, though. Because even if you choose a 100% natural carpet fiber, it won’t matter if you use chemical finishes on the carpet or toxic padding. Suddenly, dust mites and mold aren’t the only concerns with carpeting. All of the chemical finishes and off gassing VOCs might be more problematic for allergies and asthma. Choosing a carpet or carpet tile made from all natural fibers with no chemical finishes would be the best allergy friendly flooring choice. The most basic choice is always the best. The padding used underneath a carpet to make it soft to walk on can harbor lots of chemical exposures. Formaldehyde is a chemical used often in carpet padding. Unfortunately, it’s not the only one. While there are a multitude of VOCs used in padding that can aggravate allergies and asthma, styrene-butadiene rubber (SBR) is among one of the worst offenders. 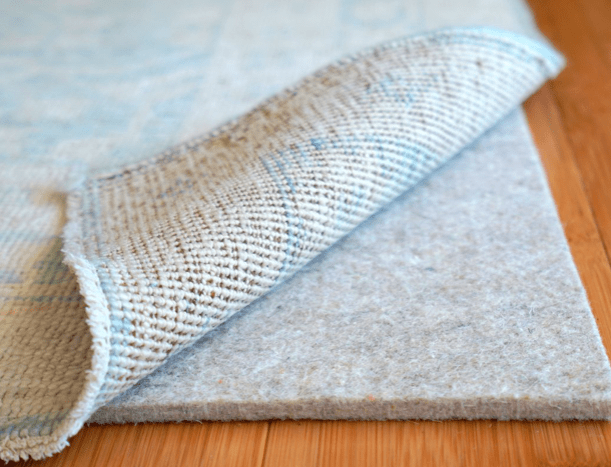 Want to avoid VOCs in carpet padding? Ask for natural carpet padding such as felt or natural rubber. Keep in mind, these non-toxic carpet pads are not commonly used. And they likely will cost more money. 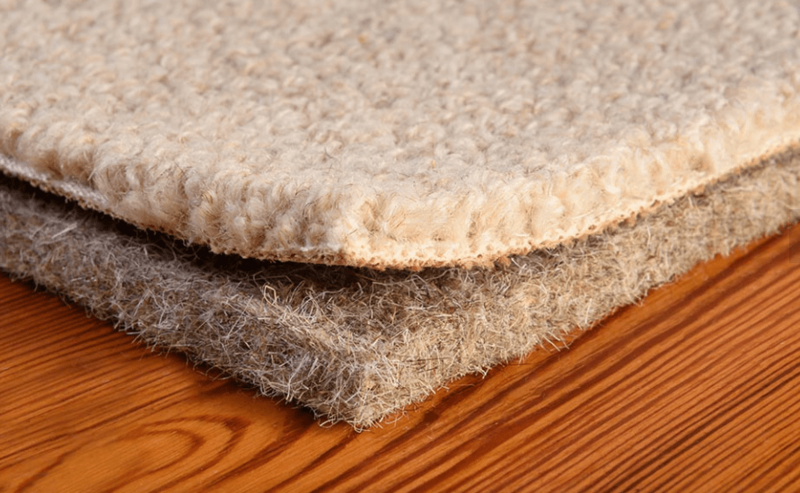 RugPadUSA’S Eco Plush rug pad is perfect for larger rugs. Made from heat pressed recycled felt, it contains no glues or adhesives. Available online at Wayfair and Amazon in a variety of sizes. It can be hard to find truly non-toxic carpet for a healthy home. And it can be overwhelming. One easy way to find low VOC carpet is to look for carpeting that’s part of the Green Label Plus program through the Carpet and Rug Institute. 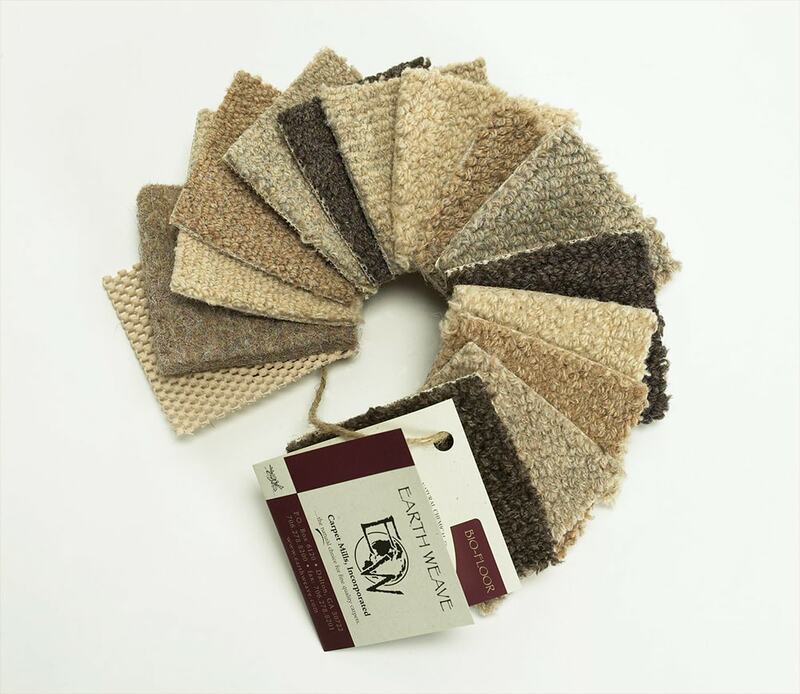 Also, purchase carpet from a non-toxic carpet company that only uses natural fibers, such as Earth Weave. Just like with carpeting, hardwood or other hard surface flooring can either be non-toxic or harbor lots of chemicals that can cause allergies and asthma and Multiple Chemical Sensitivities. Yes, even hardwood flooring or laminates can cause allergies or asthma. Solid wood, bamboo or eucalyptus flooring would be excellent allergy friendly floors. As long as you are very mindful of what finishes and adhesives are used. Engineered wood and laminate flooring are easy to sweep clean and mop. They won’t hold onto mold, dander, dust or dust mites. But the chemical exposures they off gas could be a major source of indoor allergies or asthma. Both floors use resins and adhesives to create a realistic “wood” look. And that’s where the VOC exposure comes. Formaldehyde is a common chemical often added to adhesives. Especially urea formaldehyde. It’s a nasty VOC and even if it doesn’t cause allergies and asthma in the short term, there are potential long-term health affects. The only way to know for sure if flooring contains formaldehyde is to ask. Contact the manufacturer directly and ask if there if formaldehyde in any part of the flooring. Linoleum and vinyl floors are NOT the same! In fact, they couldn’t be more different. Linoleum flooring sounds old school because it is. It’s been around for more than a century. But it’s also made from non-toxic materials that our great grandparents would have used. Which makes it a great allergy friendly flooring choice for a healthy home. I love that linoleum has naturally occurring anti-microbial properties. Which means bacteria and dust mites won’t thrive easily on it. Anti-static properties of linoleum means it naturally repels dirt and dust. Could this possibly be the best flooring for allergies? Uh, yeah, it’s a contender! Vinyl flooring, on the other hand, is widely available and cheap. But that’s because it’s made of purely synthetic ingredients and usually contains PVC and chlorinated petrochemicals. This stuff can off-gas many different VOCs into your indoor air. Which can be a nightmare for indoor allergies and asthma. Cork Floors: The Best Allergy Friendly Flooring Choice? Cork would be the flooring that I would put in my house (except for bathrooms) when it’s time to choose a floor. Here’s why. Cork is a softer surface. Made from the same material as wine corks, it’s spongy with a lot of give. After all, cork is about 80% air. Which means it’s soft on your feet and joints. It’s also GREAT for sound dampening. Perfect for living rooms and bedrooms! Cork won’t scratch or dent easily. In fact, it just bounces back. It is not easily stained. You can clean it with just soap and water. 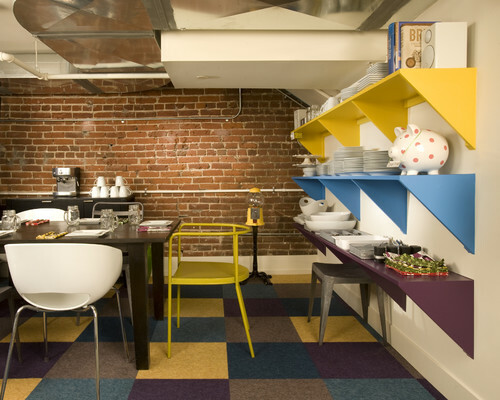 Don’t want flooring that looks like a cork board? No problem. You’ll be surprised at the colors, patterns and textures that cork can look like. Cork does need to be finished with a wax or coating, so ask the manufacturer whether the finish is non-toxic. Cork is not as hard to find and install as you might think. Mass retailers do sell cork flooring. You just must be careful, as with all flooring, to ask what chemicals and VOCs could be found in the sealers, adhesives, etc. As I’ve said, I’m always looking towards home products that would meet WELL Certification standards in a home, even though the WELL Certification is for commercial buildings. WELL Standards do not specify what type of flooring to use, such as carpeting or hardwoods. And the WELL Standard looks at the entire health of the human body, not just focusing on one aspect, such as allergies. With that in mind, floors that meet WELL Standards all have one thing in common. They must strive to reduce or eliminate a person’s exposure to VOC emissions and harmful chemicals, including lead, PCBs, perfluorinated compounds, flame retardants, phthalate (plasticizers), isocyanate-based polyurethane, and urea-formaldehyde. In general, the floors must not have a lot of nasty stuff in them. Makes sense. The flooring, whatever type it is, must also be easily cleaned. So whether it’s carpet tiles that are vacuumed and can be replaced, or linoleum that can be mopped, cleanliness is a hallmark of a WELL built environment. Acoustic comfort is also one of the WELL Standards for a environment that nurtures health and wellness. Yes, loud noises and too much noise can impact your health. Something to keep in mind when choosing flooring that might not dampen sound but only makes it worse. Our whole house is nothing but 100 year old pine flooring, with a few area rugs. It seems to help a lot with our allergies, but it’s about time to change out the area rugs, so this will help a lot. I was wondering what I should be looking for, so thanks for writing this! Aww, thanks, Mikki! Old pine flooring sounds awesome! Yeah, I’m a lot less concerned with area rugs than whole room flooring. When you don’t have the carpet pad and adhesives underneath to attach to the floor, it’s way better! My son has asthma. I will change my carpet now with other kind of flooring. Thanks for sharing these article. I will ask my husband about what kind of floor are we going to put in it. Thanks for sharing these very helpful and informative article. Good luck, Clarisse, with whatever decision you think is best for your son’s health! An awesome sharing got enough info for my new writings. Thanks for nice sharing. So, you’re saying you got educational information to use as research for your posts?